British pioneer aviator. The first pilot to carry airmail. Photograph, signed. A real photograph postcard by the Bournemouth View Company. Captioned 'Mr Hamel. 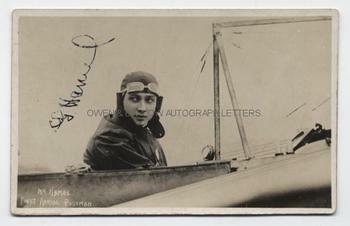 First Aerial Postman' and with a good autograph signature in ink on a light portion of the image. The photograph was probably taken at Hendon and shows Gustav Hamel seated in the cockpit of what is possibly a Bleriot monoplane. Gustav Hamel was taught to fly by Bleriot in 1910, when he was then aged 21. He quickly became a favourite at airshows and a prolific air racer and provider of public exhibition flying. He set several speed records but is probably best remembered for becoming the first pilot to carry airmail when in 1911 he carried the World's first airmail on a flight from Hendon to Windsor in his Bleriot monoplane. Gustav Hamel disappeared during a flight over the English Channel in May 1914 and his body was never recovered.